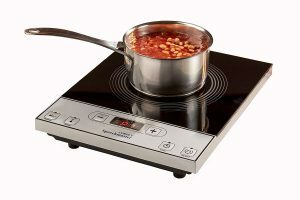 Now Available From our Independent living shop.Single talking induction hob.This single induction surface hob is specifically designed to enable blind and partially sighted users to cook with confidence. With settings and functions fully vocalised, this hob makes induction cooking accessible. All functions are spoken in a clear male English voice. The controls have a good tactile feel and the hob has a smooth, wipe-clean surface. For your safety, the hob turns off immediately when a pan is removed. Safe, fast, easy-to-clean and compact, simple operation allows cooking to be done by selecting either power level or temperature. A timer is also included to enable the hob to turn off after a preset period. For cooking on an induction hob, you need to use cookware that has a magnetised base. This means that if you hold a magnet to it, it should stick. A magnet is included in the box so that you can check your existing pans. Suitable cookware for induction hobs is made from stainless steel with a magnetised base, enamelled steel or cast iron. Suitable for pans up to 10.5″ in diameter. Please note: After extended use, the hob will get hot. Due care and attention should be taken.